Attorney General Loretta Lynch admits the obvious. She shouldn’t have participated in the orchestrated clandestine tarmac meeting with Bill Clinton. Whew! Now that’s off her chest. Are we supposed to think differently about her now? What will history write about Loretta Lynch, another failed appointment of Barack Obama? Lynch revealed what we already know about Democrats; that they hate getting caught. 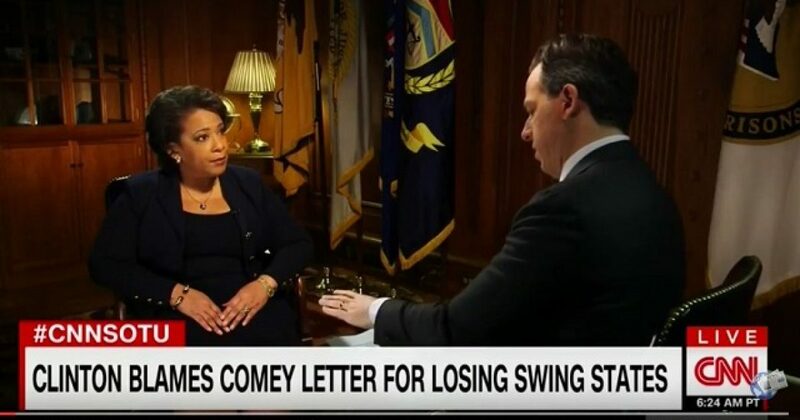 In an interview on CNN, Lynch discussed the meeting with Bill Clinton, and the fact that the meeting was held as former Secretary of State Hillary Clinton was under investigation by the House Subcommittee on Benghazi. “You make a mistake and you own it,” Lynch told CNN’s “State of the Union” on Sunday. And what was the consequence for having a meeting that could only be construed one way? Versus standing up and having the same conversation? “My greatest concern has always been making sure that people understand that the Department of Justice works in a way that is independent and looks at everybody equally. And as Bill Clinton was famous for saying, “I feel your pain!” Except in this case, I don’t. Like Holder before her, Lynch was a horrible AG. Just another dyed-in-the-wool Leftist, who cares only about keeping Democrats in power. Thus, the Democrats thought they had gotten away with this. They had swept yet another scandal under the rug, thinking America would simply dismiss it. But this was another brick in the wall, and part of the reason Americans didn’t trust crooked Hillary.